West Virginia votes Tuesday. With Hillary Clinton leading Barack Obama by 40 percentage points or more in some polls, the outcome is not in doubt. But the expected vote in one of America's whitest, poorest and most rural states points up the problems Democrats fear Obama will have in November with rural whites, especially older ones and those who have not been to college. Stephen Braun of the Los Angeles Times reports on interviews with Democrats in Moorefield, W.Va.: "Some fear voters will be turned off by Obama's black heritage. Others, they say, will find reason to doubt his patriotism or will perceive him to be an elitist. It remains unclear how racial unease will factor into election-day decisions come November. Those hidden impulses are elusively difficult to capture in polling. 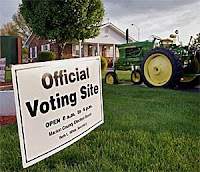 But seasoned Democratic players here reckon that some racially tinged voting will inevitably occur far beyond Hardy County's cresting hills." As the Democratic race for president focuses on two of the most rural states, West Virginia and Kentucky, where Hillary Clinton is heavily favored, her husband is "ginning up resentments" against Barack "Obama and his elitist political/media cabal allies," ABC News correspondent Jake Tapper writes on his "Political Punch" blog. "Hillary is in this race because of people like you and places like this and no matter what they say. And no matter how much fun they make of your support of her and the fact that working people all over America have stuck with her, she thinks you're as smart as they are. ... They say I have been exiled to rural America, as if that was a problem. I don't know about you, but I'd rather be here than listening to that stuff I have to hear on television." Tapper wrote that Obama is avoiding "any real campaigning in West Virginia." After he posted, the Obama campaign announced it would hold a rally in Charleston, West Virginia's capital and largest city, on Monday, followed by one in Louisville, Kentucky's largest city, Monday night. Obama is expected to be in the Lexington, Ky., area on Tuesday, the day West Virginia votes. Kentucky votes a week later, as does Oregon. Lending institutions in the Farm Credit System, the major source of loans for farmers in the U.S., have been experimenting with financing community facilities in agricultural areas. The pilot program would become permanent under a rule proposed yesterday by directors of the Farm Credit Administration. The plan would allow loans for "essential community facilities, basic transportation infrastructure," disaster recovery, rural-development projects sponsored or guaranteed by government, and "venture capital funds that invest in rural businesses that create jobs and economic growth under certain conditions," FCA said in a press release. The agency said it has approved such loans "on a case-by-case basis to initiate pilot programs" since 2005, and 37 lending institutions in the system "have made investments through these pilot programs." Machlyn Blair of Blackey in southeastern Kentucky talked with former Sen. John Edwards last fall about what it's like to live in a poor place, during a stop on the "poverty tour" of Edwards' presidential campaign. When he saw himself on television with Edwards, "My perspective began to shift," the 21-year-old said in an essay on National Public Radio today. "It made me realize that when lots of Americans think about poverty they probably think about all the usual stereotypes. Like hillbillies, junked out cars and kids without shoes — they probably think about here. . . . I always knew that things didn't add up around here, though. I saw people working hard every day and then going home with nothing. When I was 17, I learned the phrase "the working poor'" — I'm not sure that anything else has made me feel as small as those three words did, because then I started to realize that struggling with poverty wasn't a personal thing, that the whole problem was a lot bigger than me or where I live." Blair said he has been unable to go to college and is considering coal mining, the best-paying job in the area. "The coal industry pays miners decent wages to do dangerous work, but the industry also tears down our mountains and pollutes our water," he said. "I guess that's a part of living in a poor place: feeling like you have to do things that are not the best choices for you or your community. You do it because it seems like the only way you'll survive." Blair concludes, "The issue of poverty isn't about debates or which political party you're with. There are people here, who are in real need of a new kind of help." To listen to his essay, click here. It was produced by the Appalachian Media Institute and Youth Radio. Obama, however, did not have anything to say about the Farm Bill, now in final form and awaiting House and Senate votes and a presidential veto. Sen. Hillary Clinton issued a press release saying that she would vote for the bill. "“Saying no to the farm bill would be saying no to rural America," she said. The coal-mine disaster that killed nine people in Utah last summer could have been prevented if the general manager or other officials at the Crandall Canyon Mine had shared key information with the U.S. Mine Safety and Health Administration, a congressional investigation has found. The report said that the manager should be charged with crimes, that "the mining company should never have submitted a request to remove coal from the section of mine where the collapse occurred, and that federal mining officials should not have approved the proposal, because of foreseeable dangers," Ian Urbina writes for The New York Times. In the face of congressional opposition, the U.S. Department of Energy said yesterday it would move ahead with its plan to split $1.3 billion in clean-coal appropriations among four projects and forsake an industry-backed project in the Illinois Basin coalfield while keeping the project's name, FutureGen. The department said it "would solicit applications from power plant developers to win a piece of the $1.3 billion the agency has set aside to help finance new coal-fired power plants that use carbon capture and storage technology, or integrated gasification combined cycle technology," writes Cassandra Sweet of Dow Jones Newswires. 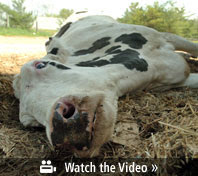 The Humane Society of the United States last week gave Agriculture Secretary Ed Schafer video that it took last month at livestock auction markets in Pennsylvania, Maryland, Texas and New Mexico, showing "downer cattle in various states of distress or neglect," reports Tom Steever of Brownfield Network. The group released the videos today. The Humane Society says on its Web site, "The shocking abuse of 'downer' cows occurs not just at slaughter plants but may be an everyday happening at livestock auctions and stockyards around the country." The organization's undercover video showing abuse of downer cows at a slaughter plant in California in January led to the nation's largest recall of meat, much of it from school lunchrooms. The group asked Schafer to ban all use of downer cows for human consumption and enact regulations requiring "more humane treatment of animals destined for the food supply, at every step from producer to slaughter." The Livestock Marketing Association said, "We intend to work immediately with the businesses where the improper handling reportedly occurred, as soon as they are specifically identified." It said the HSUS refused to meet with LMA before holding a press conference today, and said "their genuine concern for animal welfare" was in doubt because the videographers "did nothing about the animals in distress." HSUS President Wayne Pacelle said helping animals "wasn’t part of this particular operation," Steever reports. "None of the on-line video shared with reporters Wednesday showed cattle actually being abused, however in all four cases, the animals were unable to stand or walk." (Read more) For audio of Steever's 30-minute interview with Pacelle, click here. Last night’s results in North Carolina and Indiana leave Kentucky as the largest state yet to vote in the presidential primaries, with the Democratic nomination still undecided. Our state has never played such a role before, but it’s possible that the closest primary on our May 20 ballot will be for U.S. senator, not president. Kentucky’s presidential primary already has an anticlimactic air about it. Nationally, more superdelegates remain at stake than regular delegates, and the candidates’ focus is shifting to them. Sen. Barack Obama may trot out some to endorse him today; Sen. Hillary Clinton has already started talking more about full seating of delegates from Florida and Michigan, which currently have none because they held primaries too early. Clinton’s end-game strategy has called for her to gain the edge in total popular vote by racking up big margins in Kentucky, West Virginia (which votes next Tuesday) and Puerto Rico (which votes June 1). But Obama’s big margin in North Carolina makes that strategy less likely to succeed, and now Clinton supporters are pointing to the other state that votes May 20: Oregon. “She needs to shake something up. . . . She has to win Oregon,” Clinton supporter James Carville, who has some experience in Kentucky, said on CNN this morning. For the rest of this memo, click here. Race and rurality aside, the big predictors in the Indiana result were age and education. Clinton won voters over 40, Obama those under 40. College education was two sides of the same coin: Degree holders chose Obama 56-44, while the non-graduates favored Clinton by the same margin. Among those who went to college but got no degree, Clinton won 56-43. Divided by whether they had been to college at all, the voters split 50-50. In North Carolina, education made little if any difference, reflecting the larger number of African American voters. Among the 10 percent of Indiana voters who are white and said race was important in their choice, 79 percent voted for Clinton. Among the 15 percent who said gender of the candidate was important, two-thirds of them women, 62 percent voted for Clinton. Among the 44 percent who defined themselves as moderates, Clinton won 53-46. Among the 23 percent who said they are independents, Obama won 53-47. Among the 11 percent who are Republicans, Clinton won 53-45. In North Carolina, race was important to 17 percent of voters, about evenly divided between white and black. Those blacks chose Obama by 93 to 6 and the whites chose Clinton by 60-35 -- the same result found among the slightly more than half of whites who said race was not important. Twenty percent of Tar Heel voters said gender was important, and Obama won 53 percent of them, carrying both men and women in that group -- indicating that while they said gender was important, it was not a deciding factor for most. The result may also reflect a resistance among Southern rural voters, black and white, to a woman as commander in chief. "In a feat of endurance notable even for the most relentless campaigner in American politics, the former president chalked up an astonishing nine events in North Carolina, beginning at 7:30 a.m. and finishing at close to midnight," Harden begins, later quoting Doug Hattaway, who was a spokesman in the White House and now for the campaign: "The rural votes have provided a real margin for her and he’s really turning people out for her by going the extra mile." Clinton told the crowd in Zebulon, "They have declared Hillary dead more times than a cat’s got lives. But people like you in places like this brought her back in New Hampshire, they brought her back on Super Tuesday." But the quotes that caught our attention came from 74-year-old real estate broker Marion Lipscomb, who just seems to us like a person of influence in Zebulon. We suspect that many American reporters have gleaned such inflammatory quotes but have not used them because they would feel obliged to add that Obama is a practicing Christian, as Mark Barabak of the Los Angeles Times noted after a similar quote today. But we tend to think that no matter where journalists hail from, they should not hide the raw underbelly of public opinion. This video, www.youtube.com/banikMDT, tells a very sad story about one night's bad choices causing life time pain and struggle. It is a PSA the Montana Department of Transportation just released and it is very powerful. Drunk driving is one of the many acts of violence we have to deal with here in Montana. Having a loved one not wear a seat belt, then die, is another. Five years ago this August, I lost someone very close to me on a stretch of Montana Highway 2. He was 15 miles from the ranch coming off of a dirt road onto the highway. It was late and we don't have lights out there. He skipped the highway and did a nose dive into a 5-foot irrigation ditch. He would have walked away without a scratch but wasn't wearing his seat belt and crushed his chest on the center console. He was 27 when he died. Lack of seat belt use isn't discussed enough out on the prairie. We all just hop in our trucks and speed off down a dirt road or empty stretch of highway. I want there to be an open forum for discussion over the seat-belt use in rural communities. Did you know that in the last five years, 1,063 drivers and passengers died in vehicle crashes on Montana roads? More than 70 percent – 751 people – were not wearing their seat belts. Single vehicle, run-off-the road crashes cause over 60 percent of the fatalities in Montana — most due to ejection from the vehicle, according to MDOT. The more people who see the video, the better chance that someone's son or daughter will chose to buckle and it will save their life. Jennifer Lehman, Great Falls, Mont. "Rural people are one of the last groups in America in which society deems to be fair game for attack," writes St. Lawrence University senior Jon Cardinal, left, in the campus newspaper, The Hill News, mentioning media representations, Barack Obama's "bitter" comment (which Cardinal says "has been misconstrued"), jokes his fellow students tell about "hicks and rednecks", and their "redneck parties, calling for their friends to wear flannel shirts and hunting hats and act as if you’re a Bible thumpin,’ Dale Earnhardt lovin,’ black person hatin,’ gay bashin,’ gun totin,’ trailer park livin,’ dumb slob. Can you imagine the outrage that would emerge if a party was held with a theme that played off of societal stereotypes of black people or Jews or women or Native Americans or other such groups?" Cardinal continues, "You can call a rural person a dumb, racist, gun crazy, religious zealot without even turning a head. To many in our urban areas and in our wealthier communities this characterization is a no-brainer. But to those people I would advise that after branding a “redneck” an ignorant rube they look in the mirror and realize that they may be acting like ignorant elitists, unwilling or too lazy to look deeper into the complexities of our society. Because the truth is that there are just as many racists in cities and among the wealthy as there are in small towns and among the working-class – racism is a disease that plagues all of our nation. They would find that people use guns in rural areas mostly for sport whereas people use guns in cities to kill other people or to protect themselves out of fear of crime. They would realize that people are deeply religious in cities and towns alike, and that our society as a whole struggles with its acceptance of homosexuality because otherwise, we would have risen up by now and ended the injustice that says our GLBT sisters and brothers aren’t entitled to the same rights that straight people are." Cardinal then mentions his own rural upbringing in nearby Ogdensburg, N.Y., on the St. Lawrence River, and how impressed he was with Obama's speech to the 2004 Democratic National Convention. "What really caught my attention was his ability to unite and to point out what we all share in common," he writes. "I hope that for the purposes of my argument here we can always remember to embrace our differences, whether they be racial, economic, gender, cultural and yes, rural versus urban, knowing that we can learn a lot from each other while at the same time recognizing all that we share in common." For the entire 1,675-word article, click here. Today, rural soldiers returning from a deployment — and eager to get home — often find themselves miles away from the closest government facility. As a result, many postpone needed behavioral care. The conference will focus on making sure rural soldiers receive timely care from the appropriate source. Attendees will include doctors, nurses, social workers, mental health counselors and veterans. Florida State University Traumatology Institute Director Charles Figley, Ph.D., will be the keynote speaker. Retired U.S. Army officer and former Wilkes-Barre television news anchor Keith Martin will be the moderator. Geisinger Health System says it is one of the nation’s largest integrated health services organizations and serves more than 2 million residents of central and northeastern Pennsylvania. Small towns all over rural America have been gaining fast-food restaurants and losing supermarkets for many years. That is probably contributing to obesity and diabetes in rural areas, suggests a study by the UCLA Center for Health Policy Research and the California Center for Public Health Advocacy. The study examined the correlation between the health of nearly 40,000 Californians and the mix of retail food outlets near their homes. For rural areas, "near" was within five miles. The study "shows clearly that you are at a higher risk for obesity and diabetes if fast food and convenience stores dramatically outnumber grocery stores and produce markets in your neighborhood," says a press release from PolicyLink, a social-justice organization. For a PDF of the study report, click here. Arizona Sen. John McCain, a longtime foe of farm subsidies, isn't changing his tune now that he is the presumptive Republican nominee for president. Last week in Iowa, a state that benefits greatly from subsides in the federal Farm Bill, he said he would veto the new bill awaiting passage in Congress. Reporter Thomas Beaumont wrote that McCain said "He was willing to risk the political backlash in heavily agricultural states such as Iowa, Minnesota and Wisconsin, which also have been among the most competitive electoral battlegrounds in the previous two presidential campaigns. But he said he hoped voters in farm states would appreciate his plan to expand markets for U.S. agricultural products abroad." (Read more) Hat tip to Barbara Leach of My Rural America for alerting us to Beaumont's story. 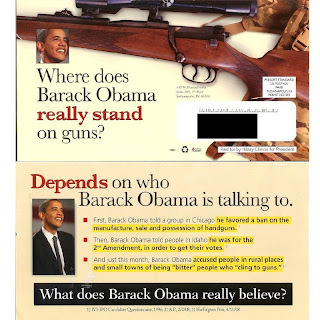 A last-minute mailing by Hillary Clinton, aimed at rural voters and gun owners in Indiana (and perhaps North Carolina), pushes the truth envelope in attacking Barack Obama for his changing positions on Second Amendment issues, writes Greg Sargent on Talking Points Memo (from which the image was taken). The mailer says Obama told a Chicago group that he favored a ban on handguns, said in Idaho that he supports the right to keep and bear arms in order to get votes, and "accused people in rural places and small towns of being 'bitter' people who 'cling to guns'." The latter quotation was selective and "omitted all of Obama's references to people's economic circumstances, leaving the misleading impression that all Obama did was 'accuse' rural and small-town Americans of those things, Sargent writes. Also, "The mailer says Obama made the small town comments 'this month,' as opposed to last, meaning it could have been drafted in late April, which of course ended only a few days ago." But it may leave the impression that he repeated the controversial comments he made to donors in the San Francisco in early April, as reported here and analyzed here. While state and local laws and policies vary widely, this seems like a story that could be done almost anywhere. How are your rural communities coping with $4-a-gallon diesel fuel and $3.59-a-gallon gasoline? Cheap electricity, particularly that generated by dams, has brought massive "server farms" of Internet-based businesses to some rural areas, with the promise of economic dividends, but skeptics say expectations are too high, Hugo Kugiya reports for the Los Angeles Times from Quincy, Wash., pop. 6,000, just across the Cascade Mountains from the Internet hot spot of Seattle, where Microsoft, Intuit and Yahoo have built a server hub. "Rural America -- particularly the inland Northwest, where wind- and water-generated electricity is some of the cheapest in the nation -- is suddenly coveted by technology companies. They construct sprawling buildings with massive computer servers, the hidden muscle and bone that process the seemingly weightless, rapidly growing data of people's everyday lives," Kugiya writes. "For a town like Quincy, built on potatoes and apples, the arrival of high tech has proved an inspirational and a cautionary tale." The town spent millions to buy land and install infrastructure, and "arrival of Microsoft and Yahoo triggered a wave of local real estate development last year," but many homes went unsold and prices have been slashed, Kugiya writes. But Aleeta Merred, executive director of the Quincy Valley Chamber of Commerce, told him,"It's like we're still waiting for something. So far, we're not really seeing the growth we expected."